For keno players who enjoy the thrill of a quick win, online scratch cards provide a fun alternative to switch things up between keno picks. Read on to find out how you can win real money by playing instant win scratchies online, and why these offer a good substitute to keno. 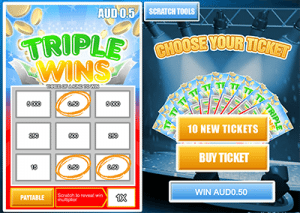 Online scratchies are virtual versions of the cardboard scratch cards which can be purchased in real life, with instant-wins up for grabs by unveiling hidden prizes. Unlike real scratch cards, which require the use of a coin, key or other sharp object to scratch the metallic covering and reveal the hidden panels, online scratchies use a simple point and click function. Just like online keno games, Internet scratchies are available for instant-play directly over your Web browser, with no downloads required. These niche games are becoming increasingly popular at online casinos, giving players the chance to reveal an instant prize over the Internet without requiring a trip to the local news-agency, lotto outlet, petrol station or convenience store. 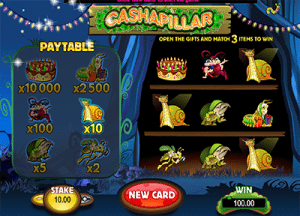 To play, all you need to do is purchase a scratch card via your online casino account, use your mouse (or touch screen if playing on your mobile device) and click to uncover all the panels. If you uncover a winning match, that prize becomes yours; for example, if you uncover three $100 panels, you’ll win $100. The prizes available vary from scratch card to scratch card, but are always clearly listed to the side of the game screen. You’ll find online scratchies available at our recommended keno sites, which are often found under the ‘other’ or ‘fun’ games categories. These online mini games use all kinds of different themes, from basic formats akin to the ones you’d buy from a retail outlet, to bubbly animated designs full of weird and wonderful characters. Just like if you were purchasing an instant in real life, online scratchies can be purchased for different costs, or higher bets. The more expensive the wager you make on your instant scratch card, the more money you stand to win. Although there are obvious differences between scratch cards and keno, both games appeal to the same kind of players – those who like to mix fun with the chance of winning real money, with no real skill required. The obvious difference between the two lies in the game format. Keno requires players to physically select lucky numbers (or make an auto-pick) and wait for the numbers to be drawn. Scratchies don’t require anything from the player, other than to scratch (or click in regards to online play) to reveal the hidden panel underneath. The similarity between keno and scratchies is that despite this difference in game play, both games rely purely on luck, and there’s no strategy that can be employed to increase your chances of winning in either. This makes both games ideal for recreational players who enjoy the thrill of risking some real money on the unknown, relishing the anticipation as keno numbers are drawn or instant-win prizes are unveiled. When playing online, both games provide the possibility of an instant win, with affordable wagering requirements making them suitable for all bankrolls. As Microgaming clearly has more online scratchies than other game developers, we recommend heading to All Slots Casino for the widest selection of instants offered by our favourite keno venues. Are scratchies recommended for keno players? Whether scratch cards are your thing or not will depend on your personal taste, but we definitely recommend that keno players give scratchies a go. Most Aussie adults will have tried their luck on a real scratch card at some point so it’s likely you’ll already know if you enjoy this type of game, but playing online definitely adds a more convenient, mess-free way to play that’s worth a try. Scratchies can be played at our recommended keno sites for real money bets in AUD, but there’s also the option of sampling these games for free in demo mode if you want to see if instant-wins are up your alley before handing over any of your own money. Sign up at G’day Casino, where you can claim a 100% matched deposit bonus up to an unlimited amount, giving you the chance to play both keno and scratchies with bonus money.